This horse gram chutney powder recipe is simple and easy to make. You can store and use this chutney powder for more than a month. After making this chutney powder, you can use it to make some variations which are given below. 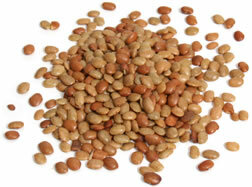 Horse gram - kulith is commonly used in the South Indian States. 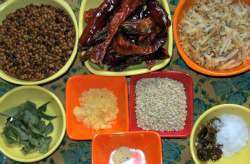 There are many traditional recipes using kulith. In Indian languages horse gram is known as kulthi (Hindi), kulith (Marathi), hurli (Kannada), kollu (Tamil), Muthira (Malayalam ), ulavalu (Telgu), gahat etc. There are many health benefits of horsegram - kulith. It provides dietary fiber, vitamin C, protein and iron. Horse gram gives warmth to the body, so it is good to eat in cold winter months. It is good for regulating menstruation but should be avoided by pregnant women. oil to fry dry chilies. Jaggery - 1/2 tsp or according to taste. Dried red chilies - 8-10, more or less according to taste. We roast the ingredients one by one and keep them on a plate to cool. Heat a pan on medium heat. Add horse gram and dry roast till it changes color, about 2-3 minutes. But do not let it turn black. Remove onto a plate to cool. Dry roast urad dal till it turns pinkish. Remove on to the plate. Roast red chilies with 1/2 tsp oil. Dry roast curry leaves till they are crisp. When all the ingredients are cool, grind together to a fine powder. You may also grind it a bit coarse if you prefer. Horsegram / kulith chutney is ready. Store in air tight bottle. It has a shelf life of more than a month. Once chutney powder is ready, you can use it in many variations to make your meal nutritious and healthy. You can serve this chutney podi with plain rice, chapatti, paratha, dosa, idli, uttapam poori etc. Sprinkle some chutney pudi on hot plain rice along with a little ghee and salt(optional). Grind all the ingredients to make into a chutney paste and serve with idli, dosa etc. You may add tadka / tempering with oil, mustard / cumin seeds, hing to this chutney paste. Mix all the ingredients together. Add water if necessary to adjust consistency to your liking. You may add tadka / tempering with oil, mustard / cumin seeds, hing to this raita. Extract juice by squeezing tamarind pulp. We need about 1/2 cup extract. Mix all the ingredients with the extracted tamarind water. You may add 1 or 2 tbsp chana dal or toor dal to the mix. Roast the dal. Add 1/2 tsp cumin seeds, 1 tsp coriander seeds after roasting them separately. 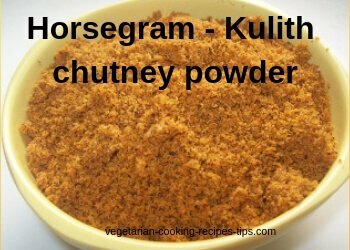 Hope you will find this horse gram chutney powder recipe useful.